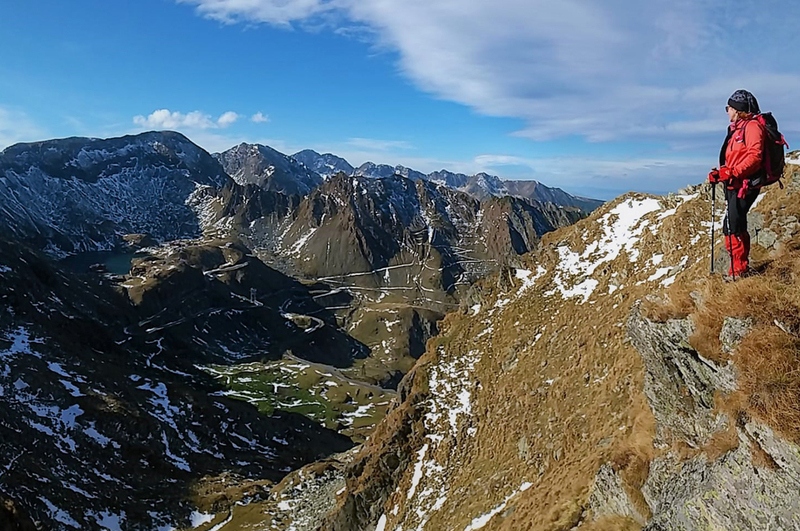 Described by the French geographer Emmanuel de Martonne as “The Transylvanian Alps”, Fagaras Mountains attracts the view with their majestic and spectacular shape. 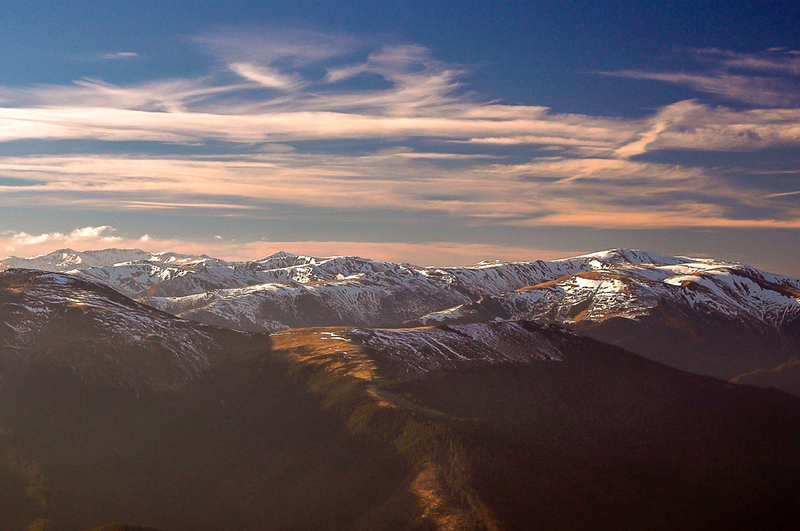 These are the highest and most grandiose Romanian mountains. Details. 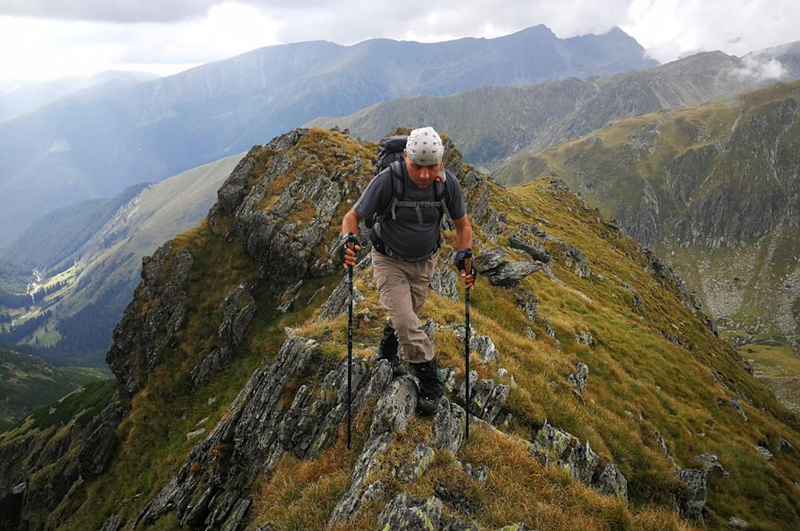 Almost 70 km long range from W to E which raises steep above 2450m and overlooks Transylvania region and a gentle tilt to the Walachia foothills, Fagaras Mountains offer the best challenging hiking from Romania. Over 20 summits above 2000m are recorded and peculiar names as “the evil valley” or “three steps from death” speaks undoubtedly about the place. Day 1. Approaching the mountains. Bucharest – Curtea de Arges – Poenari Citadel – Balea Lac (260 km). - Curtea de Arges Orthodox Cathedral. Built in the 16th century by Prince Neagoe Basarab of Walachia is the burial place of many kings, queens and princes of Romania. Its legends have inspired many Romanian poets. - Poenari Citadel. Dracula’s eagle nest, the citadel was built on a high cliff above Arges River, initially in 14th century only as a surveillance tower, then developed by the Walachia king Vlad the Impaler as his refuge. 1470 steps to be hiked up to the fortress. - Transfagarasan - one of the most world scenic alpine roads that pass through the Carpathians Mountains into Transylvania. The trip ends at the highest place of the road, Balea Lac chalet – 2034m altitude above the sea. The chalet was built on the shore of Balea glacier lake, declared Natural Scientific Reserve in 1932. Day 3. Balea Lac chalet – Paltinu Peak (2399m) – Caltun Lake – Negoiu Peak (2535m) and retour. 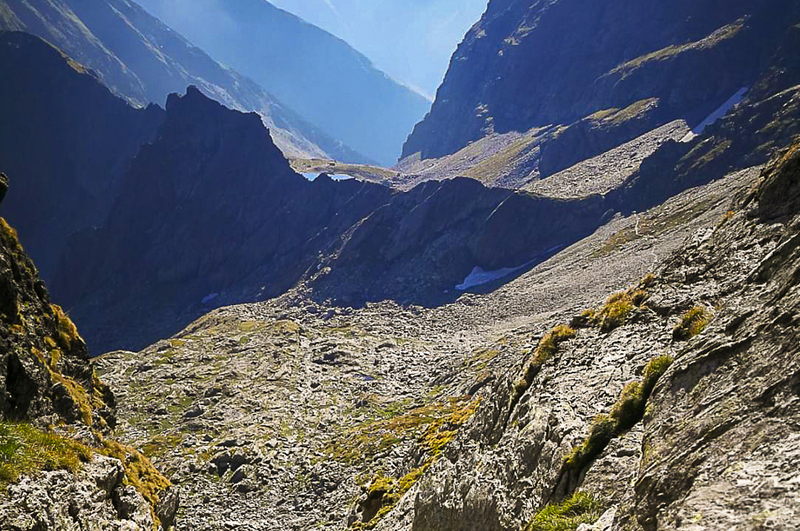 Duration: 8-9 hrs; length: 11 km; climb: 1300 m, descent: 1300 m.
From the chalet we take the western trail that goes to the opposite way from the previous day. Intense hike for 1 hr to reach Paltinu Saddle. We take south finding a reach area with springs; the path is helped by chains then a new saddle dominated by Laita Peak (2397m). 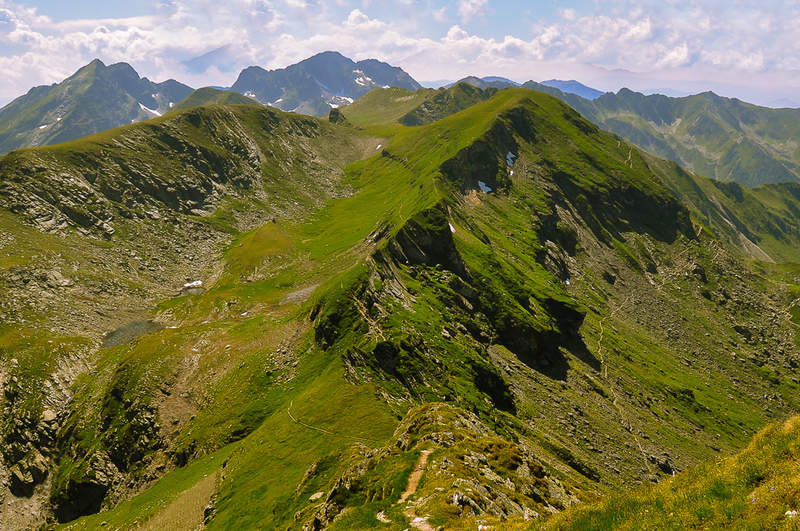 Going round the peak, a little descent, and then a chain roped path with meanders up to Laitel Peak (2390m). Steep descent to Caltun glacier Lake placed at the margin of the same circus, 2135m elevation. We leave the lake by crossing a section of fallen rocks. Next is an area with stone slabs then climb on a winding road until we get a glimpse of a cauldron on our left. The narrow stone walls are threatening, the escape way to continue from this enclosure being done by chimneys (lathe) like “The Devil lathe”. After 1,5 hrs from Caltun Lake we reach Negoiu Peak (2535m), the second highest from Romania. Return on the same route. Day 4. Day 4. Balea Lac chalet – Capra Ridge – Fereastra Zmeilor (Dragon’s Window) – Arpasu Mare Peak (2469m) – Podragu chalet (2136m). Duration: 7-8 hrs; length: 12 km; climb: 900 m, descend: 850 m.
The route follows the main ridge to the east. We start to hike up to Capra saddle on the same route from the first day, then down to the main circus where Capra lake and a memorial dedicated to four climbers killed in an avalanche are found. The opposite slope is next direction up to a famous rock, Fereastra Zmeilor (Dragon’s Window), placed in a saddle on the main ridge. The place is steep and we need special attention to cross. No wonder the next passage is called “Three steps from death”. We descend then through a cauldron and go up again to reach Arpasu Mic Peak (2460m). 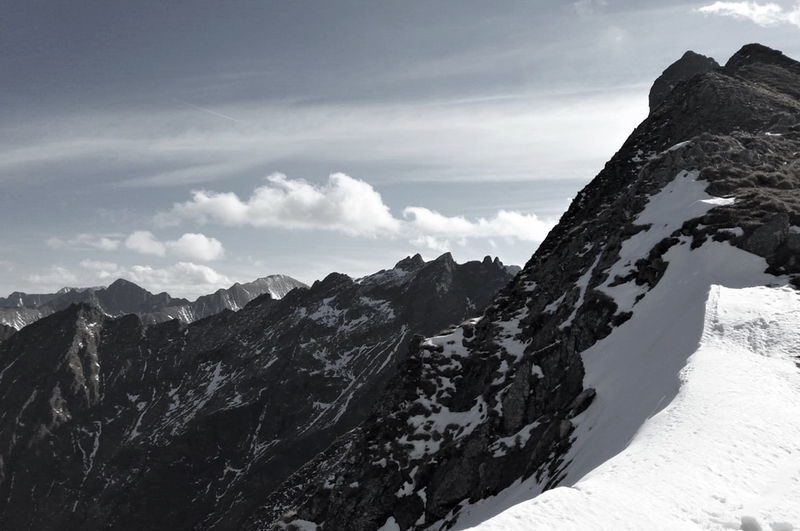 The trails follows the level curve, slightly down; we see Buda Lake on the right, then a new monument dedicated to the victims of the snow is shown up in the Vartop Saddle (2287m). 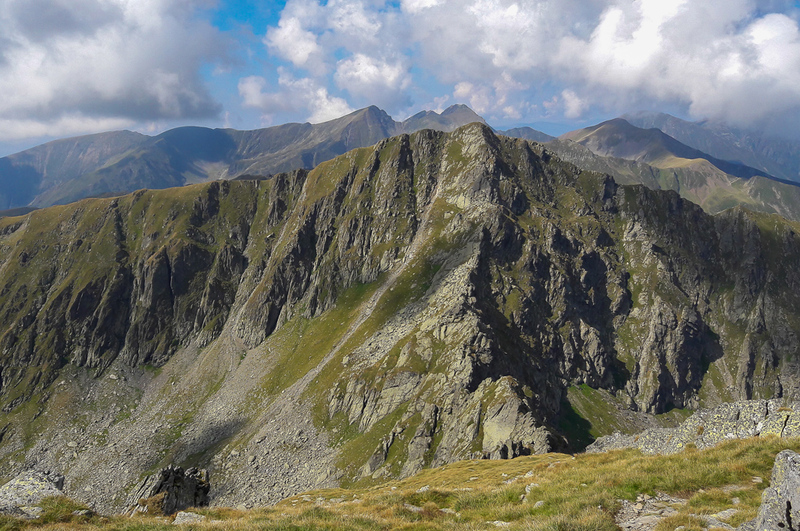 The next peak is Arpasu Mare (2469m), then Podu Mircii (2461m). From here we descend near Podu Giurgiului glacier lake, then we reach Podragu Saddle (2307m). We are able to see here the beautiful glacier valley which goes to north, flanked to east by the steep ridge. The chalet is placed near the glacier lake in the main circus. Day 6. Valea Sambetei Chalet – Sambata Monastery. Duration: 3hrs; length: 5km; descent: 900 m. Sambata Monastery – Rasnov – Bucharest (270km). The trail continues to follow down the valley for about 1 hr and then we take a dirt road for another 4kms. Before to take the asphalt road we find time to visit the nearby Sambata Monastery. The history begun in the 17th century when a member of Brancoveanu family built the first wooden church. In 1696 Constantin Brâncoveanu, the ruler of Wallachia (1688 - 1714), re-built a monastery in stone, in order to strengthen and save the Romanian Orthodoxy from the danger of Catholicism, which appeared when Transylvania was under Austrian-Hungarian Empire (end of 17th century). In 1785 the place was partially demolished, being rebuilt in 1926-1946. From the monastery we drive to Bucharest. Arrive to Bucharest late evening.